Form IDI-18 or the "Individual Estimated Tax" is a form issued by the Ohio Regional Income Tax Agency (RITA). Download a PDF version of the latest Form IDI-18 down below or find it on the Ohio Regional Income Tax Agency (RITA) Forms website. Amount of this Payment ……………………. 2. 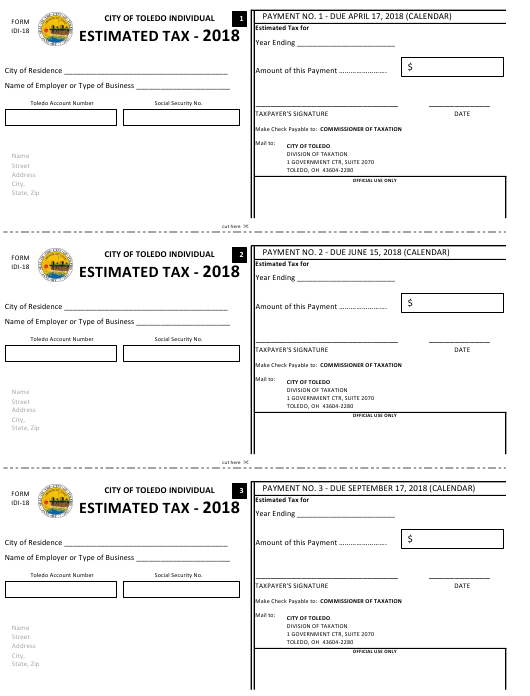 Multiply Line 1 times 2.25%, the current Toledo tax rate. 3. Enter all municipal taxes which you expect your employer to withhold from your wages. 4. Subtract Line 3 from Line 2, enter on Line 4.
the sixth month; 67.5% by the 15th day of the 9th month; and for INDIVIDUALS, 90% by the 15th day of the 1st month following the taxable year). 6. If you have any overpayment credit from a prior year, enter it here.